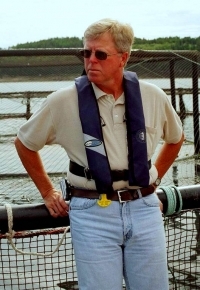 Sweeney International Marine Corp. (formerly Sweeney International Management Corp) was established in January 2002 as a one-man business operation working with the salmon farming industry in southwest New Brunswick's Bay of Fundy region. Since that time, the business has grown to become one of the aquaculture industry leaders in marine environmental management, providing services to both public and private industry sectors as well as all levels of government. In March 2009, SIMCorp Marine Environmental Inc. was incorporated to provide the same level of service to the aquaculture industry in the Province of Newfoundland & Labrador. In December 2011, SIMCorp opened the doors to their third office and laboratory facilities located in the NRC building in Halifax, Nova Scotia. The new office and lab allows SIMCorp to better service our Nova Scotian clients, while providing additional in-house lab services. Since opening in 2002, SIMCorp has gained considerable experience working with licensing and environmental regulations, environmental compliance monitoring, waste management and new site applications in each of the respective jurisdictions. Our teams have worked with species including Atlantic salmon, Arctic char, Rainbow trout, Atlantic halibut, Atlantic cod, green sea urchins, blue mussels, sea scallops and sea cucumbers. The SIMCorp client base now includes the vast majority of marine finfish operators in the Atlantic region and as such the company and the quality of services are well-known to all levels of government throughout the region. SIMCorp is committed to only the highest ethics in environmental, community and corporate stewardship. The SIMCorp project teams deliver a wide range of expertise and skills to our clients. The teams include access to a Senior Project Manager, Marine Environmental Biologists as well as administrative support personnel, with expertise in the areas of finfish and shellfish production, environmental management, site remediation strategies and waste management plans. SIMCorp teams can provide assistance to our clients in all facets of aquaculture project development, implementation, management and monitoring. SIMCorp project teams can assist in the preparation, development and implementation of projects from the initial conceptual stages through to full commercial production.